You’d be surprised how often it happens. You pick up a yearbook, see a cover design you really love, or flip through and eye a font you like, then flip to the back looking for the colophon to read the specs and… nothing. A number of yearbook staffs get overwhelmed with the workload when pages are due, or don’t understand the significance of a colophon, or exactly what belongs in one. So it’s a step that gets skipped. Some yearbook advisers have specific reasons they believe colophons are important and details they like to include in them. But make no mistake – your yearbook staff should consider a colophon a required part of the book. If you are one of those advisers who might not know exactly all of the elements that should be in your colophon, we’ve compiled a list to help out! Details about the book’s cover – Who designed it? What were the specifications or materials used on the cover and endsheets? Any special books specs – UV coating? Augmented reality? Were any currents events, spring or autograph supplements used? Also, be sure that your colophon includes who readers can contact if they have any questions or concerns. 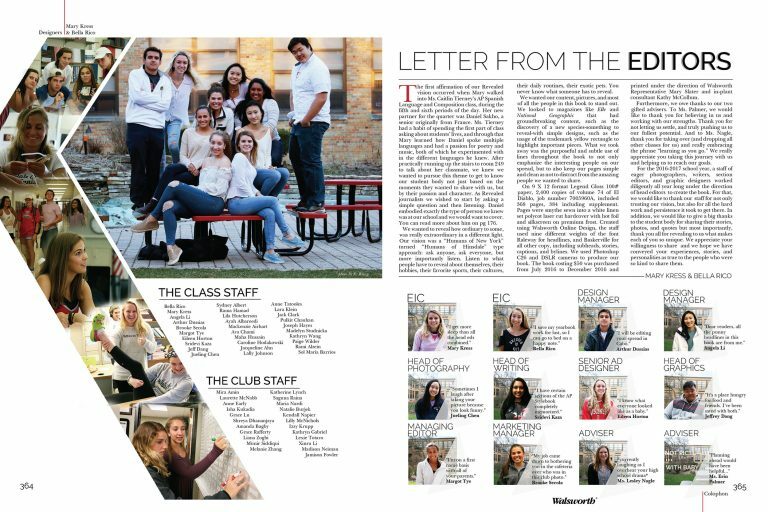 Often, staffs choose to include a thank-you letter from the book’s editor-in-chief, as well as a staff photo(s), and package it together in a fun, attractive yearbook staff spread. That’s optional. The important thing is to actually take the time to do a colophon. It might seem like an unnecessary, extraneous task during a busy year, but it matters.